showing your approach to dealing with cultural differences. ICAD stands for InterCultural Competence and Development. This is the combination of training workshops and learning processes based on the ICP tool. 1. Recognition: How competent is a person to recognize his/her own cultural assumptions and those of others around him or her? 2. Respect: How capable is a person of appreciating perspectives other than his/her own? 3. Reconciliation: How competent is a person to reconcile different perspectives? 4. Realization: How competent is a person in realizing the necessary actions to implement the reconciliation of cultural differences? 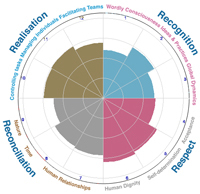 InterCultural Competence Profiler (ICP) tool provides an overall assessment of your current intercultural competence, showing your approach to dealing with cultural differences. InterCultural Competence and Development = the combination of training workshops and learning processes based on the ICP tool. This can also be linked to our Culture Compass Online to give extended learning after a workshop or training event. ICAD and extended version of ICAD/ICP which includes corporate culture. e-learning versions of ICP/ICAD combined with the CCOL (Culture Compass), intended for participants where the use of these tools is not integrated with any training or workshops led by THT consultants/trainers and is used for online learning only. 'InterCultural Competence - Assessment and Diagnosis' by prof dr Fons Trompenaars and prof dr Peter Woolliams. If you have any questions please email profile@thtconsulting.com.